With the economy changing so quickly these days, everyone's looking for ways to cut back on spending. Shopping has been replaced by shopping for bargains. This made us wonder if you can still get great deals on eBay. Are prices down? We write a lot about sellershow they're faring, what effects eBay policies are having on their businesses and so on. But we never met a seller who didn't also buy on eBay. We have to admit, we also like it. So we decided to don our buyers' hats and take a closer look at the issue. And like the good journalists we are, we also looked outside to pose our question. To start off, we turned to eBay's Buyer Central discussion board. A place that now competes with Amazon and sells lots of commodity items increasingly through sellers such as Buy. The go-to spot for one-of-a-kind items, including collectibles and antiques. Buying commodity items such as cell phones and razor blades? 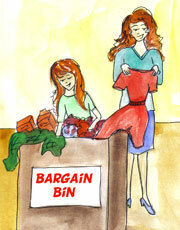 You're more likely to find better bargains outside of eBay, according to discussion board posters like Dragonfly37b. "I can find better or equal prices somewhere else," the poster notes. "I find myself buying more items from Internet Web sites other than eBay to save a few bucks and a few gray hairs." Apparently for these buyers, shipping and handling charges on eBay are still a problem, with some sellers charging higher postage to make up for having to charge less for the item itself. Collectibles may be another matterand this is a category where you can still snap up some bargains. There will always be a market for these items. "I have seen some price slippage," says poster mudshark 61639, who sells vintage toys. But "truly rare and desirable items still get attentionand bids. I have noticed fewer early bids and more last-minute bids in my auctions. I attribute this to buyers who do not want to bid up an item early and a greater use of sniping programs." OK, now we were ready to start our own research. Brad's been tracking golden-age comics from the 1940s to 1950s on eBay for quite a while. Usually they're too expensive to afford, easily costing hundreds of dollars in collectable condition, with rarer books in great condition (think early Superman or Batman comic books) fetching into the thousands. He did an Advanced search for completed auctions, using the keywords "Superman" and "CGC" (for the Certified Guaranty Company, whose initials mean the comic has been objectively graded). He chose those comics with the CGC added because that was a category he could judge easily. Wow! Zeroing in on items that had sold, the prices seemed very good. World's Finest No. 2 in CGC 5 (a very good grade, although not "mint") sold for $622 and received 13 bids. That's a good amount of activity, and someone got a very good deal. The same was true for Superman No. 3, which sold for $2,307 and received 27 bids. Not only that, but Superboy No. 1 didn't even sell, despite its $2,000 Buy It Now price taga real bargain, according to The Overstreet Price Guide. Before leaving this subject, we should mention that tempers are still running high regarding eBay's search function. Some think there are bargains galore now because buyers can't find things. "Search is so bad that quality items listed on eBay at $1 no reserve are not getting any bids," says Jonathan Garriss of the Professional eBay Sellers Alliance (PeSA). "It's not because the deals aren't good enough, it's because buyers can't find them." It didn't take much to get PeSA President Joe Cortese going on this contentious topic. "Imagine you're Saks Fifth Avenue. You have a shop window about 20 feet wide by 9 feet high, with 500 really great items beautifully decorated in that window. Great merchandise, great prices, very popular. People come to Saks because they know you have such a fantastic selection of what they are looking for. "Now, your window dresserfor no apparent reasonsays to you: 'Let's take that 20-foot-by-9-foot window and reduce it to 3 feet by 3 feet," Cortese continues. "Instead of showcasing all of those great products at once, we're going to force customers to focus on a new space, but now it's only 3 feet by 3 feet. We'll rotate those 500 items within the confines of that space. Customers will have to watch for their item as it comes up on rotation, or they will have to come inside and ask us for it. Sure it reduces validity, but it also reduces clutter." Where does all this leave us? For savvy eBay buyers with some cash to invest, good quality items can be found and scooped up. On the other hand, thanks to eBay's search innovations, you may just miss out on finding what you're shopping for. I used to buy several items a week on ebay for years. So did most of my friends. Since I am also a seller, I still purchase an item every couple of months but my friends who were only buyers left ebay a long time ago. Way to go ebay geniuses. You messed it up for all of us. You'll be next like the big car companies and financial institutions. So much for eBay's desire to improve the buyer's experience. Make it difficult to find the good buys from the best sellers. Then assist the bad sellers (see buy.com) with false feedback scores, low to no listing fees, and reduced final value fees. That's leveling the playng field. Is eBay Still the World's Best Business Incubator? Despite changes aplenty, opportunities still abound on eBay for entrepreneurs.